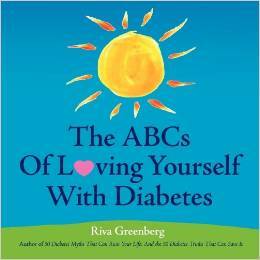 If you haven’t noticed, although I imagine that would be hard given I think I’ve plastered the news all over my site, I’ve published a book – The ABCs Of Loving Yourself With Diabetes. “After just a few pages, I knew I would read this book cover to cover and cherish it for many evenings to come. What a wonderful little ode to self-acceptance and motivation. Like a skilled quilter, Riva has somehow managed to patch together poetry, self-help, and diabetes advice into an irresistible pattern. When cynics can be won over, it makes me all the prouder. Thank you Amy. Note – The ABCs Of Loving Yourself With Diabetes is intended for all ages: seniors, boomers, teens, tweens and in-between. Available at Amazon. One more note – The book is priced at $19.95 because a significant portion of the purchase price is being donated to diabetes research.